I’m sure everyone has seen the stereotypical video gamer in the movies, the guys who live in their mom’s basement and don’t ever come out. Well those may still exist, but these days video games have become more and more popular with Fortnite becoming a huge phenomenon. My problem as a father of two boys is that I love video games but I also need to keep in shape, and there just isn’t enough time for me to do both on a daily basis. That is, until I came up with a way to combine the two. Note, there are some affiliate links to Amazon below, full disclosure. I include them to help pay for the costs of the website with no cost to you. Thanks for your support. The first time I tried this like 5 years, I played games on a recumbent Schwinn bike we had. It worked pretty well although I don’t think I was getting the best workout, it made my legs really tired but I never got super sweaty or worn out. I remember playing X-Com on the Xbox 360 forever on that bike. The problem was though, I wasn’t burning enough calories. After I went through P90x, I realized that while the bike was better than nothing, I really needed to do more on daily basis in order to lose more weight. That when the elliptical machine came into play. Now I know you’re saying, how can you play video games on an elliptical machine, won’t you fall off? Well, if you have bad balance or a machine that throws you off balance, then you might be right. 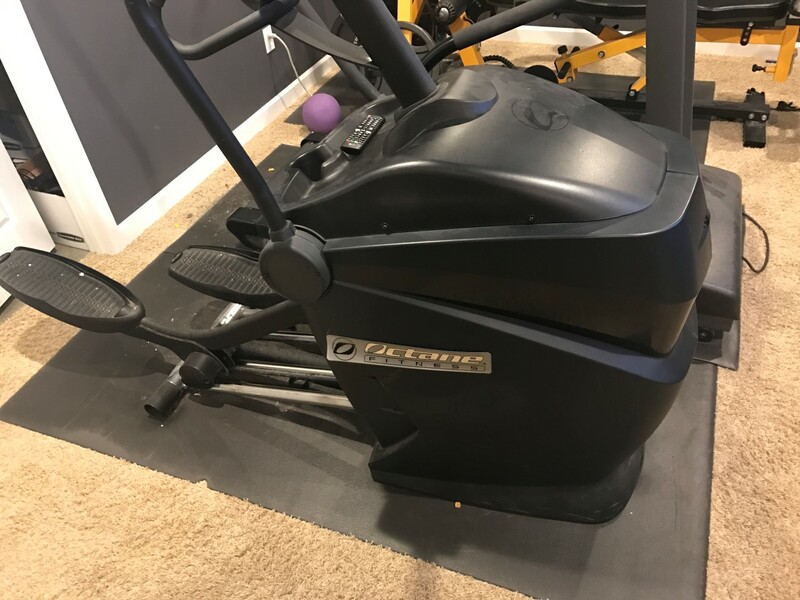 Luckily the machine we have is perfect, the Octane Q35 Elliptical machine. We bought it used for $500 off craigslist for those who are looking for a decent used elliptical machine. They come up for sale quite a bit. In any case, I started playing games on it. The hardest part by far is when the games get intense I have a tendency to lean forward too much, lol. But other than that, it’s a fantastic way to make working out time fly by in no time. Right now I’ve been playing a ton of Overwatch on it, try to master that. How successful can you be? Well I was able to make platinum basically only playing on the elliptical machine. 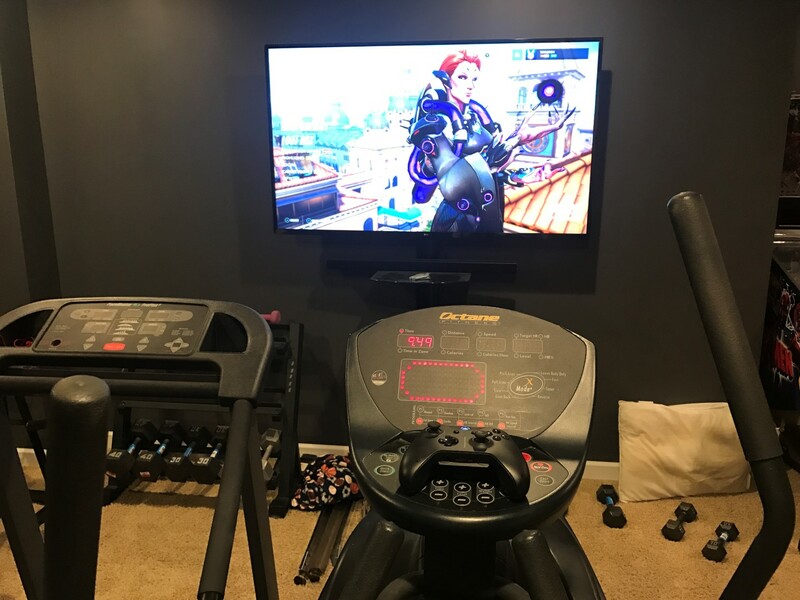 I don’t know how many others are playing Overwatch on an elliptical machine but there can’t be many. One minor trouble spot with the elliptical is voice communication via the headset. When you’re working out, unfortunately all the heavy breathing comes through the microphone, so it actually sounds like you’re exhausted from playing video games. It makes it a little difficult to play with your friends, which is honestly the only drawback I’ve come across. I usually have to tilt my mic up higher so it only pics up sound when I talk loud. Can you game on a treadmill? We have a treadmill, but I haven’t tried that. Honestly, I don’t think I would. It looks like it would be kind of dangerous if you tripped because your hands are on a controller and not able to catch you, so you’d fly off the back and onto the floor or into the wall. I don’t think I’d recommend it unless you’ve got some sort of safety mechanism to keep you safe. If you have any other ways to get a video game workout, let me know. I’d like to hear about other ideas. Next articleCan you bust in shuffleboard? How do you Master Overwatch?